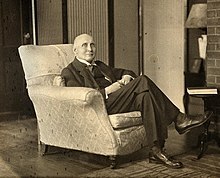 Alfred North Whitehead, OM (15 February 1861 – 30 December 1947) was an English mathematician who became a philosopher. He was born in Ramsgate, Kent, and died in Cambridge, Massachusetts, USA. He wrote on algebra, logic, foundations of mathematics, philosophy of science, physics, metaphysics, and education. He is the co-author, with Bertrand Russell, of the important Principia Mathematica. ↑ Lowe, Victor 1985/90. Alfred North Whitehead: the man and his work. 2 vols, Baltimore: The Johns Hopkins Press.